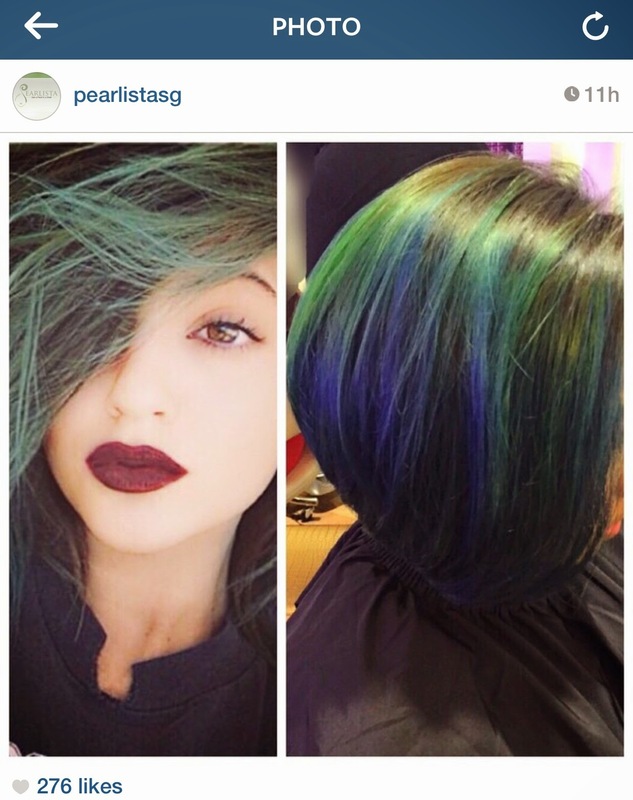 Yesterday was like a 'breakthrough' for Pearlista Hair Salon. We did away with the conventional and tried to 'up' our game by being adventurous. More like, the customers that come to us are like so hip and happening we have to keep up with them! They are so trendy we also have to act like we are like them. "You can do like this kind of hair?" US: Yeah sure! Of course! Can one! When we say hip and happening Pearlistas, we mean it. Those who without having to think twice and tell us, "I rimas. I want to cut really short." Tadaaaaaa! 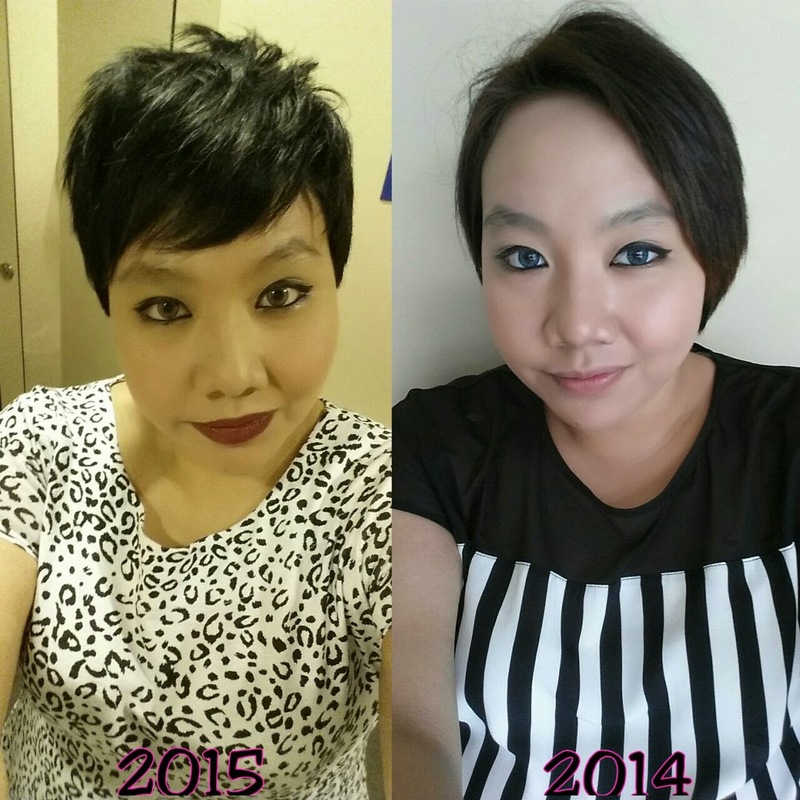 Loving your pixie, Pearlista Nurul! Those who wanna play with colours and say, "Got turqoise, green, blue dyes?" Tried we did smalam, mixed our available halal dye colours..... and the result is just so...susah la nak describe. You all see la for yourself. 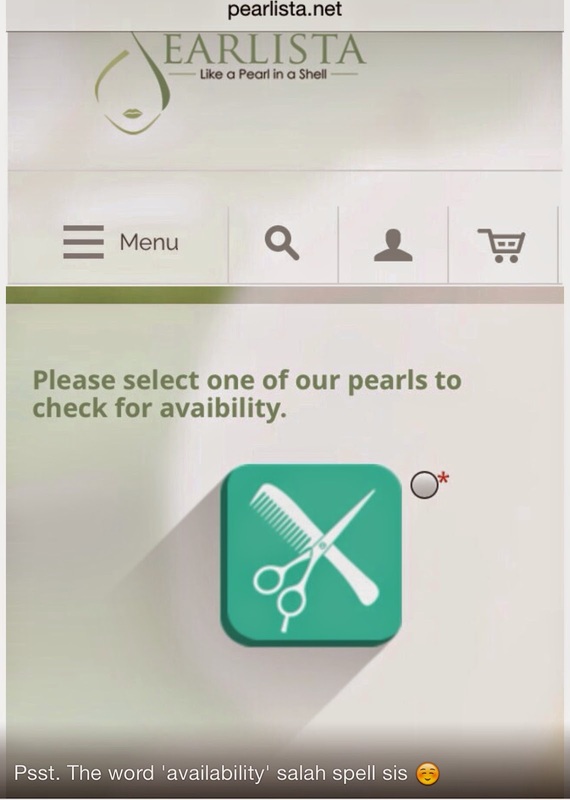 Thanks for the trust Pearlista Izzati! But there are also Pearlistas who just want to come to be pampered with the thorough shampooing/conditioning/Argan/Creambath treatment done by our stylists. Like a mother, my heart is swelling. Mad proud of my stylists. We are slowly getting the hang of operating a business. As in a managing a proper business. Sometimes it gets abit overwhelming. Ya la appointments made through my phone somemore. And this 97248866 hotline has been so berjasa to me with real estate matters too. Only now when I answer calls, I would get, "Hello. Ini Pearlista eh?" Appointments are made via this phone. Through whatsapp. And when I am occupied with property matters and Pearlista related whatsapps start pouring in, that's the tricky part. COS WHATSAPP HAS A BLARDY 'LAST SEEN AT' and that DOUBLE BLUE TICKS. Really don't want interested Pearlistas to feel upset..."Eh aku msg dia...dia dah baca abih tak reply seh si Nura J ni. Biadaps." Usually I'll reply but there were times when super nice Pearlistas gave me a gentle reminder like, "Hi so sorry to bother you but did you get my message?" More like I should be the one apologising. So I sat down with E and told him this cannot go on. I cannot have people feeling segan to give me reminders and I cannot go on overlooking important messages and worse, double booking appointment slots. 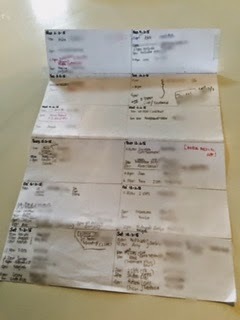 For the past three months, I have been doing the traditional way of slotting in appointments. Ah ah buku hutang. Lol. 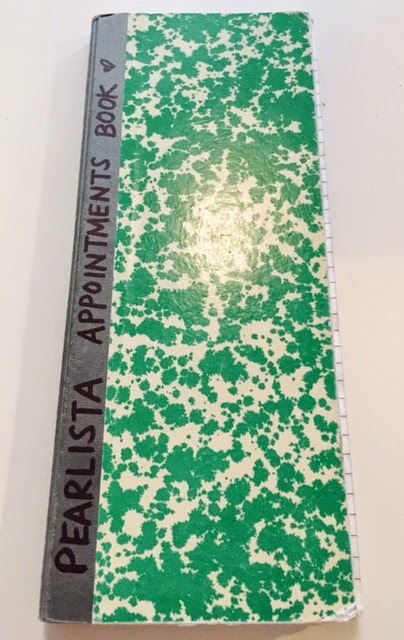 Everytime a Pearlista intends to book appointment slots, I'll be flipping the pages. Ya la 1 page 1 date mah. "Ma, how to make this easier? I really can't stand the flipping!" She quietly took Nyla's drawing paper. Dah tak pakai punya cos my mom, she memang suka recycle. Haha. By the way, nice try with the sketching of Booo, Nyla. Maybe you should just stick to making handicrafts and not drawing. Hehehe. 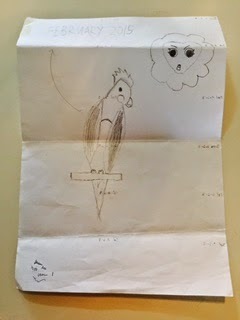 And my mom used this other side and created her very own template like this. Which is like really really easy for me. E: So you carry this drawing block paper everywhere eh? Me: Ya la! Senang tau! No need to flip flip! I think he see me also he kesian....he got to work with the online booking system. I shouldn't be loudhaling about Pearlista's website now because there are like....erm....spelling errors which have been kindly spotted by Teacher Pearlista Rozaleen! Hehe. Thanks sis for the psssstttttttt. Grammatical errors jangan cakap la. So we have corrected them but final changes can only be finalised by next week. So you grammar/spelling nazis, pls be patient and bear with the errors. I know very sakit mata punya. Sabar k! I think I just launch la the website because it is really going to make things easier for both you and me. You don't need to whatsapp me and worse, wait for my reply regarding confirmation of your slot. So here it is Pearlistas! We say bye bye to buku hutang and hellllloooooo online booking! Yeeehaaaaa. February slots are filling up fast. Thank you ladies. We don't open on Sundays. 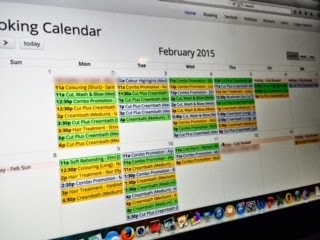 Our Saturdays are fully booked right up to end March. Thank you again! So if you want to secure your slot, pls book fast. If you intend to book more than 1 slot (let's say your geng also want to come along), got to do it one by one k.
Korang ni nak short cut je la. Hehe! Thank you E and Siangko for this!